There was a massive show at Sparkassen Arena in Kiel last night with three world title belts at risk. The big winner was Zsolt Erdei who moved up a weight class to unseat reigning WBC cruiser champion Giacobbe Fragomeni by majority decision. Hungarian Erdei had held the WBO light heavy belt for 11 successful defenses over five years but saw 40 year old Fragomeni as vulnerable despite the 25 pound weight differential. Italy's Fragomeni won the WBO crown during a technical decision over Rudolf Kraj last year but was held to a draw by ex-IBF titlist Krzysztof Wlodarczyk in May in which iron-chinned Fragomeni was floored, a rare occurrence. Despite the 200 pound cruiserweight limit, Erdei came into the bout at 178 lb, only three over the light heavy class and his edge in quickness over Fragomeni was apparent from the opening bell. 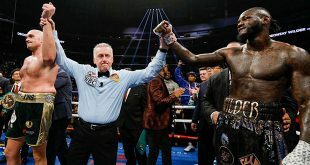 Erdei's sharp boxing skills carried the early rounds but the powerful champion wasn't the least bit discouraged from coming forward and was bossing the bout from the midway point onward. 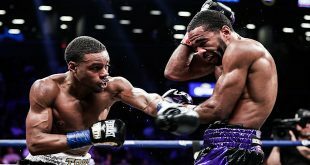 The last few rounds featured good two-way action and by the time the dust settled, the judges favored Erdei by majority decision via marks of 115-113 (twice) and 114-114. Erdei, 31-0 (17), wins the WBC cruiserweight title and stays undefeated while Fragomeni, 26-2-1 (10), suffers his first loss since dropping a European title fight to David Haye in 2006. The vacant WBA super middle title was up for grabs last night and it was Dimitri Sartison, 26-1 (17), who came away the big winner, stopping Croatia's Stjepan Bozic, 23-4 (13), in the fifth. Hamburg based Sartison had previously challenged Mikkel Kessler for the WBA belt, getting KO'd in the 12th round in 2008. Super featherweight Vitali Tajbert, 19-1 (6), bounced back from a European title loss last December to capture the Interim WBC bauble by posting a points verdict over Mexican southpaw Humberto Mauro Gutierrez, 26-2-1 (19). 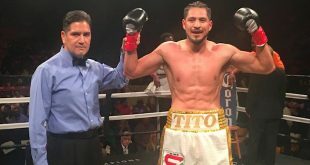 Ironically, Gutierrez won the Interim WBC title in August over the same fighter, Sergey Gulyakevich, that handed Tajbert his sole career defeat to date. Red hot middleweight prospect Gennady Golovkin, 18-0 (15), stayed on track by knocking out previously undefeated Russian southpaw Mikhail Makarov, 10-1 (5), in the second round.